Showcase your love of the Industrial Age and science fiction in your garden with this Heartwood Heart Poplar Steam Piper Bird House. The unique, curved triple roofs on this unit contrast the straight, tapered sides, bringing a futuristic look to the shelter in moments. The gray tone of each galvanized, metal roof and brown color of the body enhance the Victorian motif, and the poplar construction completes this effect. 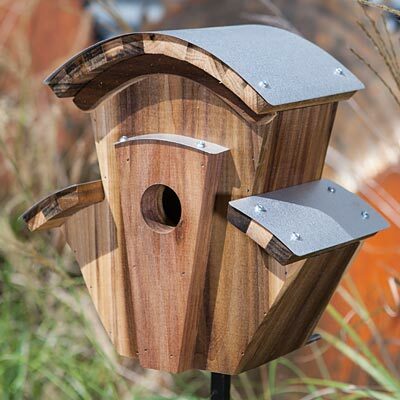 A triangular front panel extends outward from the main body of the roost, and a 1.5" diameter entry hole on it allows birds to access the interior. This opening is suitable not only for chickadees and wrens, but also for eastern bluebirds, swallows, and flickers, creating shelter for a wealth of bird species. Drainage on the base helps keep the nest dry, and ventilation gaps prevent nestlings from overheating. Display this home on a wall or post using its attached hanging hook, or add a mounting plate (not included) to the base to place it on a pole. The wooden construction highlights the natural world, while forming a quality shelter that will remain lovely for many seasons. Place a fantastic home for your feathered friends in your landscaping with this Heart Poplar Steam Piper Bird House. Made in the USA. Woodlink Post Mount Squirrel Baffle, Bronze, 22"